Home > Mark Your Calendar!!! > Jose Santos: Hall of Fame Jockey. Jeff Carle’s First Guest in the Gallery. I’m very excited about the series, “Guests in the Gallery” hosted by Jeff Carle. The interview sessions–which I suspect will feel a great deal like “Actors’ Studio”–will take place at the National Museum of Racing and Hall of Fame on Tuesdays during the 2014 Saratoga meet at 11AM. Tuesdays, as you probably know, are “dark” days–meaning that there’s no racing across the street at Saratoga Race Course. These dark days give race fans a day to breathe, sleep in or–if you’re like most race fans–to move like moths to light bulbs toward anything that feeds your addiction to our intoxicating sport. The rest of the year you can do other things during your free days–but on these glorious few days of the Saratoga racing season, of course you crave the company of other horse-obsessed people and the intimacy of our racing community. 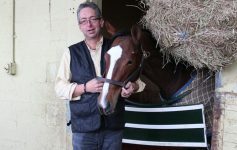 Racing analyst/handicapper, Jeff Carle started his career in our industry as a jockey, then as a trainer. His deep intellectual understanding and ability to recite chapter-and-verse, cold, led him naturally to analyzing and handicapping races. He’s been a fixture at OTB-TV for many years now, and is growing his audience by leaps and bounds. So! Now you know who’s the talent–who’s the producer--and of course the title of this article told you that Hall of Fame Jockey Jose Santos will be Jeff’s first Guest in the Gallery this Tuesday, July 22. If you’re a race fan, you’re a fan of Jose Santos. If you’re a new race fan, you’ll hear stories about Jose Santos, and become a fan. I’ve pasted his Hall of Fame notations below, so you can learn if you’re a newbie. I’m a fan of Jose Santos. I have a brief story to tell, and I’d be grateful if you’d indulge me. On July 3, 2007, I attended the fireworks at the Saratoga Raceway as it was was known at that time. (Saratoga Casino and Raceway now.) I went to the fireworks with a friend. I hate fireworks, actually, but it was Fourth of July weekend, and I had nothing else to do. And besides, she said that we were going to meet up there with Jose Santos. Well, that got my attention. I could ignore the fireworks–I was going to hang with THE Jose Santos! News Flash: the fireworks were loud. REALLY loud. Bright, and loud. And of course other than the polite handshakes, no conversations took place at the Raceway. However. The next day was the actual Fourth of July, and I was going to a picnic at the home of the same friend, Celeste. Coolity, Personified! All Grooviness! Surreal! Jose Santos showed up at the picnic! (And I admit that I had to think, “He had nothing better to do than to hang out with us? ?”) Ha! He strode into Celeste’s kitchen, and proceeded to whip out some sort of alcohol-infused beverage that featured melon-flavored liquor. It smelled wonderful and it tasted even better. One of those perfect ice-cold summertime beverages that no doubt had the potential to fell a ship full of pirates. It was yummy. It was ice-cold, and yummy. And I think that I had one or two, too many. But at any rate–that same Fourth of July was the day that the wonderful, gorgeous, feisty Funny Cide raced at Finger Lakes, in the Wadsworth Memorial Handicap. Now, I’d had a couple too-many of Jose’s melon flamethrowers, but not so many that I was deadened to the vibes of others. Jose and I sat on the sofa, preparing to watch Funny Cide’s race. We drank the melon. As Funny ran beautifully and perfectly–making everyone at Finger Lakes that day feel as if on top of the world–Jose Santos sat next to me, saying, “I should be on him,” and a couple other things that made my heart break. And yet, through his personal sadness, the (soon-to-become) Hall of Famer could not hold back his love for his horse. His desire to see Funny Cide triumph once again came out as he leaned forward, snapping his fingers, and verbally urged his mount to win that race. Even as he hurt because he could not be the one to pilot Funny home–his love overcame his personal sadness. This, I believe, is the mark of a great Jockey. For the first time, ever, I–as a race fan–came to understand perhaps a bit of the heartbreak that jockeys experience when they’re injured, and no longer can do the thing they love more than anything in the world. Jockeys live for their sport–for that amazing ride atop a 1,200-pound bullet. They live for their horses, and for we, their fans. And sitting on Celeste’s sofa next to the great Hall of Fame Jockey, I felt his pangs. He wasn’t just a fan watching any horse race–he was watching his horse race. And he was supposed to be on that horse’s back, thundering for home together. Honestly, I don’t remember if the great man cried. But I remember that I did. 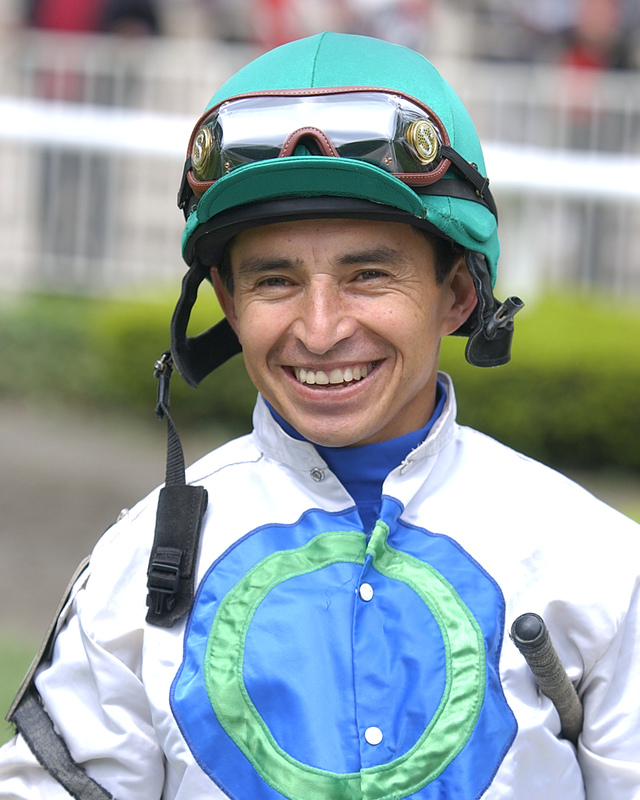 Your entire Saratoga Summer will be made, just hearing Jose–one of the greatest Jockeys, ever–speak. I know that Jeff will ask questions that will bring out some great stories. You’ll take away a memory, and commit yourself to this sport–our sport–even more than before. Who knows? Hearing Jose tell his story may very well help propel you toward your own path to greatness. That’s the real value of heroes, you know: they teach us how to achieve our goals, just by being in our midst. Have a wonderful time at Jeff Carle’s “Guests in the Gallery.” Be blessed by Jose Santos and his stories. Take away a little insight about Jockeys and the depth of their hearts, and their commitment to this sport. To our sport. Ours is the greatest sport on Earth, and Jose Santos is one of the truly greatest Jockeys ever to mount a Thoroughbred. Born on April 26, 1961 in Concepcion, Chile, Jose Santos first raced horses at Club Hipico de Concepcion in his native land, following in the footsteps of his father and three of his seven brothers. He moved to the United States in 1984 and was the top money-winning jockey four years in a row from 1986-1989, winning the Eclipse Award for Outstanding Jockey in 1988. Santos had purse earnings of $14,856,214 in 1998, a record a t that time. He also led New York riders in number of wins for three years, and he ended Angel Cordero’s streak of 11 consecutive riding titles at Saratoga. A winner of seven Breeders’ Cup races, Santos captured his first victory in a Triple Crown race when he piloted Lemon Drop Kid in the 1999 Belmont Stakes. 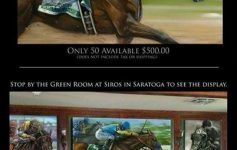 Four years later, Santos captured the first two legs of the Triple Crown when he took the Kentucky Derby and Preakness Stakes aboard Funny Cide. Other notable victories for Santos include the Travers Stakes, Florida Derby (2), Kentucky Oaks, Wood Me morial, Carter Handicap (3), Jockey Club Gold Cup (3), Personal Ensign (2), Man o’ War (2), Hollywood Gold Cup, Manhattan Handicap (2), Coaching Club American Oaks (2), Personal ensign (2), Saratoga Special (3), Canadian International Stakes (2), and Hopeful. 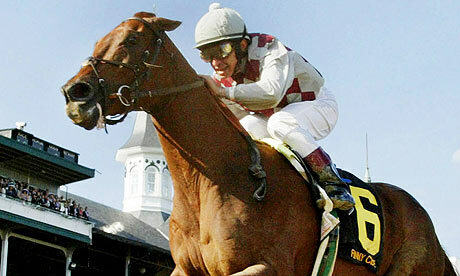 The most memorable of his seven Breeders’ Cup victories was his 2002 score in the Classic aboard 43-1 shot Volponi. Along with Funny C ide, Lemon Drop Kid and Volponi, Santos rode Manila, Cryptoclearance, Chief Bearhart, Gulch, Meadow Star, Criminal Type, Colonial Affair, and Fleet Indian, among others. Santos received the George Woolf Memorial Jockey Award in 1999 and retired in 2007 with 4,083 victories and earnings of $187,242,605. Jose Santos was inducted into the National Mu seum of Racing’s Hall of Fame in 2007. Previous Article Mucho Macho Man in Retro: Thank You, Pegasus. Next Article Using Horses as Props. What Fresh Hell is This?